Commonwealth Games Federation president Mike Fennell has said the confusion that marred the women's 100m final was caused by a "communications blunder". 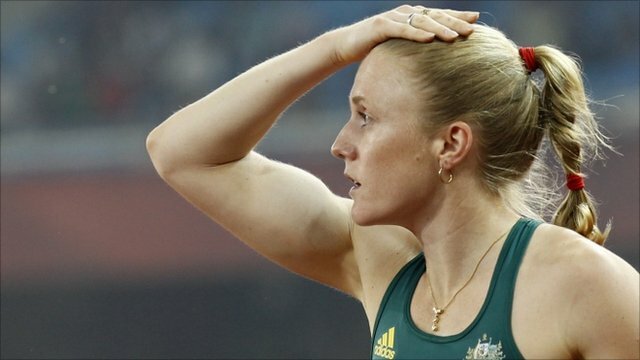 Australia's Sally Pearson crossed the line first only to be told of her disqualification for a false start as she was preparing to collect her medal. Pearson was disqualified following a protest from the England team, who had Katherine Endacott promoted to third. Nigeria's Osayemi Oludamola was eventually declared the winner. Pearson was left shocked and in an emotional press interview said, "I'm just numb right now, I don't really know what I feel. I'm obviously devastated and disappointed." Asked for his explanation of the situation, Fennell declared: "A number of things happen concurrently. The result are announced, then you're allowed a certain time to make a protest. Someone did not communicate that a protest was being made. "There was a problem over communicating that appeals had been launched. There was a major communication blunder by the athletics officials." Fennell was clearly unhappy with the Australian sprinter's treatment. "If there is a protest, then the athletes should be put on hold and told the reasons why. We received complaints about it. That treatment is unsatisfactory," he added. 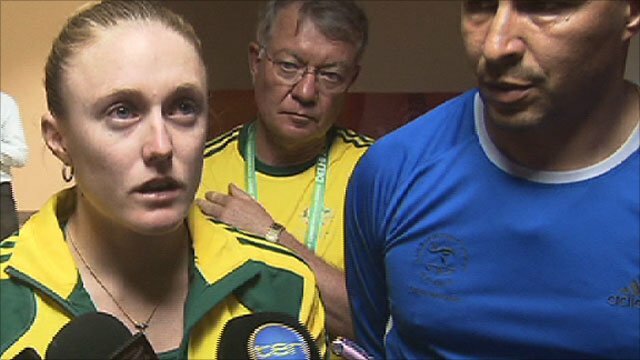 Pearson was waiting to walk out and collect her gold medal when, four hours after the race, she was informed that she had been disqualified. "I was told I was in the clear," said a tearful Pearson. "I was set to walk out for the medal ceremony but then we were called us back and told there was a protest lodged. "No-one told me what it was about and who it was against and that's probably most disappointing thing. I was told all sorts of different stories. I was never once told the truth or told what was going on. I don't think that was fair. "This is our careers. To have run the race, do the victory lap and told everything's OK, then told you can't have the medal... I have to deal with it." Australian Athletics team manager Eric Hollingsworth said the result was a blow not just to Pearson, but the country. "At the end of the day she is without question the fastest girl in the Commonwealth and we made a tough decision to put her in and to get that far and to win it, then to have it taken away, is obviously not good." Eventual winner Oludamola was surprisingly critical of her fellow athletes. "Something went wrong with the start," she said. "I don't know why they allow people to participate in the competition if they cannot follow the rules." The race started controversially when English sprinter Laura Turner was shown a red card for false starting despite claiming that noise from the stadium was putting her off. However, the electronic timing system also flagged up a false start by Pearson and, with Katherine Endacott finishing fourth and facing the prospect of winning a bronze, the English decided to launch a protest. Australia appealed unsuccessfully against Pearson's exclusion and were denied a first Commonwealth Games 100m champion in 36 years. Endacott was unsurprisingly happy to find herself being upgraded to the bronze. "I didn't think I could do it - my target was to reach the final, so I'm over the moon to win a medal, I do feel sorry for Sally though," she said. How golden are Delhi sprint medals?